Regio’s en landen wereldwijd proberen koploper te zijn op een bepaald gebied van expertise of innovatie. Door voorop te lopen in de ontwikkeling van expertise en kennis, kan een ecosysteem zichzelf op de kaart zetten en een boost geven aan innovatief ondernemerschap. Ook in Nederland proberen we op vele verschillende gebieden uit te blinken. En door de ontwikkeling van vele initiatieven, 10+ innovatieve hubs en netwerken zijn we hierin vaak succesvol. Wat gaat er goed en waar liggen nog kansen voor verbetering? Lees hieronder meer. Ecosysteem in het klein De afgelopen jaren zijn er in Nederland steeds meer science parken en kenniscampussen ontstaan: inmiddels zijn we minstens 39 campussen rijk¹, de een verder ontwikkeld dan de ander, maar allemaal met een specifieke focus op onderzoek, innovatie en kennisuitwisseling. Deze campussen zelf kunnen gezien worden als een soort kleinschalige ecosystemen, die weer onderdeel uitmaken van de bredere regionale economie. 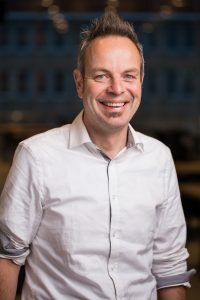 “Er is geen receptenboek voor het ontwikkelen van een succesvolle Campus”, zegt Bert-Jan Woertman, commercieel directeur Campus van de Technische Universiteit Eindhoven. “Het is een dynamische mix van ingrediënten. Het gaat om het bouwen van effectieve, zichzelf versterkende netwerken. Het gaat om het vergroten van de aantrekkelijkheid van het campusterrein voor partijen van buiten. De buitenwereld laten zien wat er mogelijk is, hoe je samen groter kunt worden.” Het succes van deze campussen is niet alleen te danken aan de ‘hardware’ (gebouwen, voorzieningen en faciliteiten), maar juist ook aan de sociale dynamiek die ontstaat en de ‘knowledge spillovers’ die plaats kunnen vinden: de ‘software’. “Toevallige ontmoetingen spelen dan ook een grote rol in deze economische ecosystemen. Management van Campussen en Science Parks zal er alles aan moeten doen om die te faciliteren en stimuleren. Dat is niet eenvoudig en doe je er niet even bij naast de ‘hardware’”, zegt Bert-Jan. Buck Consultants geeft aan dat een ‘dedicated’ open-innovatie organisatie een belangrijke succesfactor is¹. 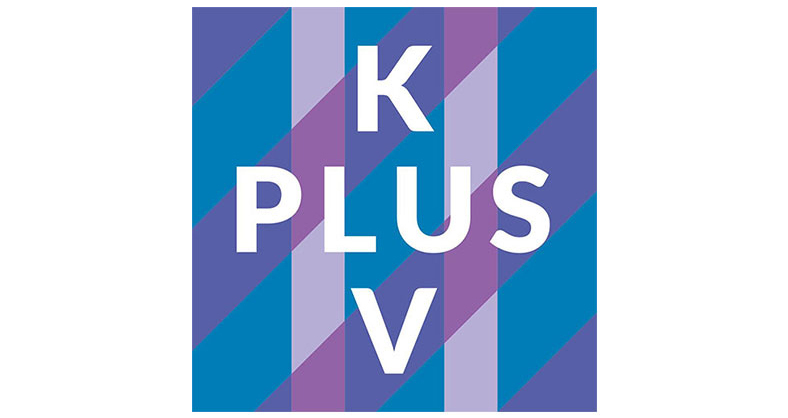 Een organisatie die zich actief bezighoudt met samenwerkingsrelaties binnen en buiten de campus, kennisvalorisatie, kennistransfer, netwerkvorming, business development en acquisitie van bedrijven. 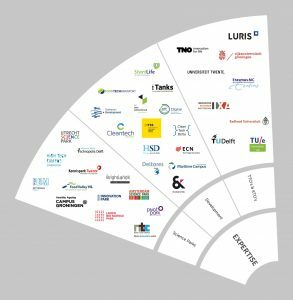 Samenwerkingsverbanden Innovatie beperkt zich vandaag de dag niet meer tot Research & Development (R&D) binnen grote ondernemingen, legt Bert-Jan verder uit. “Tegenwoordig ontstaan innovaties vaker in horizontale, multidisciplinaire netwerken, kruisverbanden tussen verschillende bedrijven en instellingen in verschillende sectoren”. Dit uit zich ook in nieuwe samenwerkingsverbanden en clusters op bepaalde thema’s waarbinnen nieuwe kennis ontwikkeld wordt en verbindingen gelegd worden. Een voorbeeld is The Hague Security Delta (HSD), een cluster gericht op veiligheid. “Door de inhoudelijke focus binnen het cluster weten wij hoe de markt, innovatie, funding en talentontwikkeling in dit domein er voor staat”, zegt Joris den Bruinen, adjunct-directeur HSD. “Hierdoor kunnen security startups geholpen worden met toegang tot kennis, innovatie, markt, talent, en kapitaal”. Countries and regions worldwide are trying to become frontrunners within a certain field of expertise and innovation. By developing expertise and knowledge and becoming a frontrunner, an ecosystem can put itself on the map and boost innovative entrepreneurship. In the Netherlands we attempt to stand out in many different fields. The development of many initiatives, networks and more than 10 innovative hubs makes that we are often successful. What is going well and where is room for improvement? Read more below. In recent years, an increasing amount of science parks and knowledge campuses have popped up in the Netherlands: by now there are at least 39 campuses¹, some more mature than others, but all focusing on research, innovation and knowledge exchange. These campuses can be seen as small-scale ecosystems themselves, which are part of the wider regional economy. “There is no recipe book for the development of a successful Campus”, zegt Bert-Jan Woertman, commercial director Campus of the Technical University Eindhoven. The success of campuses is not only due to the ‘hardware’ (buildings, services, and facilities), but also has to do with the social dynamics that exist and the ‘knowledge spillovers’ than can take place – the ‘software’. “Serendipitous encounters play a big role in these economic ecosystems. Management of campuses and science parks will have to do everything in their power to facilitate and stimulate this. That’s not easy and definitely something you can simply do next to the ‘hardware’”, says Bert-Jan.
Buck Consultants indicate that a ‘dedicated’ open-innovation organisation is an important factor for success¹. An organisation that actively works on building collaborative relationships within and outside of the campus, knowledge transfer, networks, business development and acquisition. Innovation is no longer limited to Research & Development (R&D) departments of big firms, Bert-Jan explains. “These days innovations often arise in horizontal, multidisciplinary networks, crossovers between different companies and institutions in different sectors”. We also see the rise of new partnerships and clusters that develop knowledge and create networks, often focusing on a specific theme or area of expertise. One example is The Hague Security Delta (HSD). 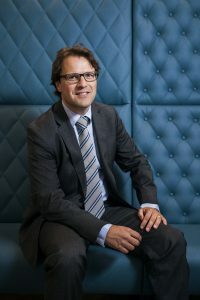 “The thematic focus within the cluster makes that we know the status of the market, innovation, funding and talent development within this domain”, says Joris den Bruinen, adjunct director HSD. “This helps to give (security) startups access to capital, innovation, market, capital and talent”. The stakeholders that represent a specific area of expertise often serve as a point of entry for startups. The cluster helps them to get in touch with organisations that are potential partners, investors, resellers and experts, or with other ‘facilitators’ in the ecosystem. Clusters like HSD also play an important role in connecting the Dutch ecosystem to the international one, for instance through fairs and foreign trips. “We utilise our extensive international network, and work with partners such as InnovationQuarter and RVO. This offers startups and innovative SMEs opportunities to penetrate foreign markets”, says Joris. 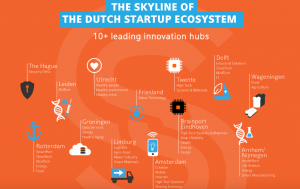 The innovation hubs of the Netherlands are connected on a national scale through StartupDelta. This has helped make the Dutch ecosystem more visible and more connected to the rest of the world. Knowledge and expertise is available to startups, which helps them develop more quickly into fast-growing companies. “No company can beat a well-functioning startup ecosystem”, says Chris Anderson², 3D Robotics & author of The Long Tail. With StartupDelta we made some important steps in the right direction. “There is a strong basis (of trust) for this collaboration. We know much better where to find each other”, says Joris. “StartupDelta has the common goal to put the Netherlands globally on the map as the centre of technological development and innovation”, explains Bert-Jan. “By setting up smart collaboration and sharing knowledge and networks, we now make even more impact on an international level”. This is shown for instance through the impact of Dutch startups during the last CES and also last year at the Hannover Messe. “I think much more is possible. The potential is enormous. Dutch universities are part of the world top. The knowledge that is being developed could be translated even better to business activity. There is no lack of new ideas and technologies, but entrepreneurship should be stimulated, facilitated and valued even more” – Bert-Jan Woertman. The many initiatives in the Netherlands yield results. But the large amount of initiatives can at times feel overwhelming, especially for startups. From the outside it can be hard for startups to see where they can find which expertise. “SMEs and especially startups need focus and speed to make traction. The large amount of initiatives can make it hard to figure out which ones to join”, explains Joris. The diagram is a first attempt to improve the visibility of the ecosystem. Regions and hubs can also do more to learn from each other. The expertise and quality of the regions and campuses is generally high, but there are important opportunities to exchange lessons learnt between clusters and ecosystems and strengthen each other on a national level. This will be a central topic during the StartupDelta Summit.